I love shopping for presents! I love get in the Leslie Knope spirit and find the perfect present for everyone on my list, and I love coming up with present recommendations for everyone else to get the people on their shopping lists. In that spirit I wanted to create some gift guides for the holiday season. I'm really excited about it! I feel like a lot of gift guides I see end up being a list of everything someone found online that was remotely cute and within a certain price range. I wanted to do something different, and compile gifts that people would buy regardless of the cost, and then sort them by price. First up is gifts for the women in your life for under $25. 1. Sigma Mini Power Haul - This awesome makeup tool kit (for $15!) comes with all the brushes you need to do your eye makeup, plus makeup brush cleaner and the famous sigma makeup brush cleaning mat. I think makeup brushes are a great gift; it's tools that will be used every day, and a good brush makes a huge difference. 2. 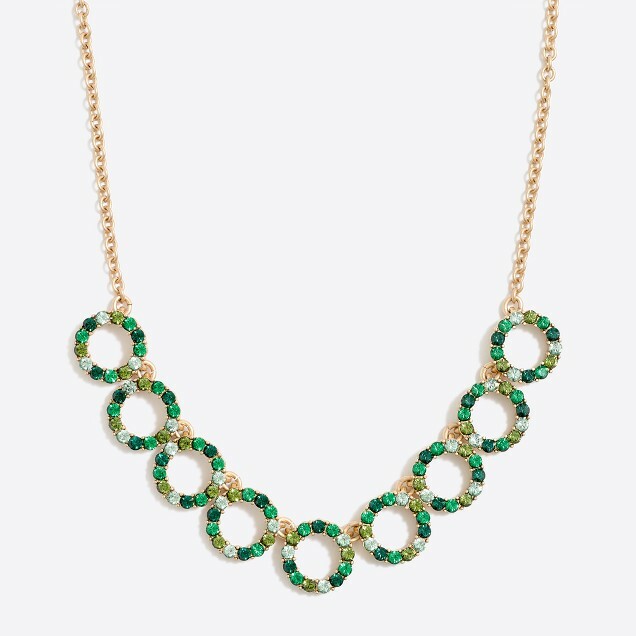 J.Crew Factory statement necklace - I love a nice statement necklace to spruce up an otherwise plain outfit, and all my friends do too! The J.Crew Factory selection is great, and the prices can't be beat this time of year. I particularly love this one because it's festive but the giftee can still easily wear it after the holidays. 3. L'Occitaine hand cream - These hand creams are luxurious, smell divine, and fit easily fit inside a handbag. I get them for my mom, aunts and grandma and they are always a huge hit! 4. Waffle henley - Everyone loves a nice cozy tee I think. Give her a gift she'll wear the next day, that's my opinion! 5. Lilly Pulitzer To Do Planner - I love that this planner is geared towards making to do lists. It's a cute way to stay organized, and since it's more expensive than the Dollar Store notepads it's not something people are likely to buy for themselves, but they will completely love it once they have it. And, think of you when the use it (i.e. every day)! 7. White Barn Candle - I feel like candles are very "in" again, and every woman I know has been burning them like crazy. I just picked up with Winter scent over the weekend and I don't know how they did it but it actually smells like winter. It's a great scent to gift because in my opinion the scent isn't too cloying, and it's festive without being inappropriate after the holidays. 8. Ear cuffs - I love getting earrings, I love gifting earrings, who's ever disappointed when they open a nice pair of earrings? No one! haha. This pair is simple but really pretty, and the price point is great. Earrings for everyone! 9. Pajamas - Cute cozy pajamas are the perfect winter gift. With the chill coming on and the nights lasting longer, it's so wonderful to slip on a new pair of pajamas. I think ones with a cute print can't fail to disappoint anyone you gift them to. Even my grandma, who was impossible to shop for, would love to open a new pair of pajamas and wear them all winter. P.S. has anyone ever seen the Parks and Rec where Leslie kills the gifting game and gets Ron an automatic door closer? Leslie Knope-ing Christmas presents is my goal this year. Who's with me? !